I use the koppen-geiger climate maps a lot but I haven't found any for Pangaea. Would the climate zones be the same if the continents were in the Pangaea shape or is it something different? It would be helpful if there was a map or something of the Pangaea climate. 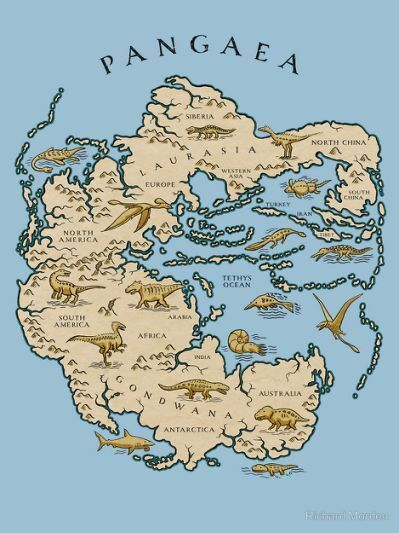 I don't own the picture AT ALL (I found it on the web :) ) it just is the shape of Pangaea I've been thinking of working with. It's pretty close to the equator so I'd imagine most of the climate would be similar to central Africa but my main question is would the climates of various areas be similar to how they are now or just totally different because of the location. Here is a 2001 paper which used climate modelling to compare two reconstructions of Pangaea--there was still some question about the precise orientation of Laurussia and Gondwana in respect to each other--and the heights of mountains such as the Appalachians and the Variscan orogeny, and using the model to compare to the paleoclimates that can be seen in the geology. In the reconstruction the paper concluded was the more likely one, the supercontinent didn't form a near-circle because Gondwana was slightly closer to the equator and a bit further east than in the map you have. 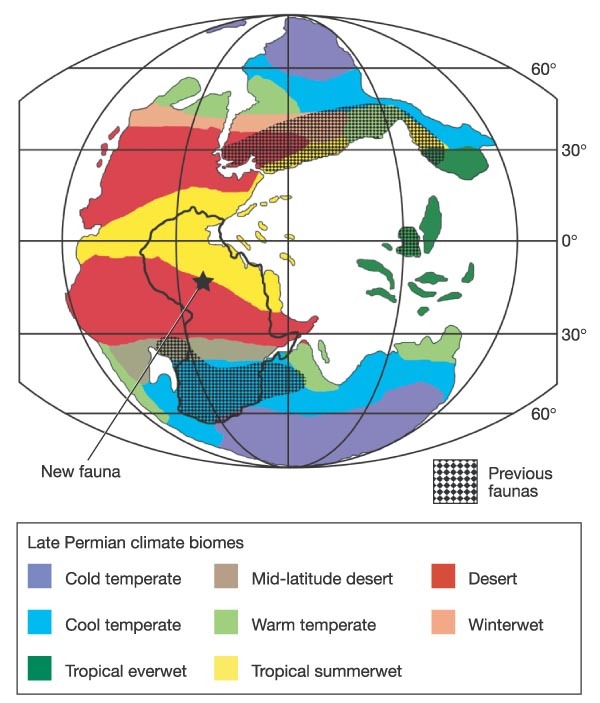 In any event, what paleoclimate data does show is that eastern Gondwana Australia on your map) had a warm temperate climate with a seasonal monsoon system. The far north and south of the supercontinent (Siberia, North China, and Antarctica on your map) had a cold temperate climate with large seasonal temperature swings. The western subtropics of both Laurussia and Gondwana (North and South America on your map) had extensive arid zones. Think present North Africa and you won't be far off the mark. It's known that arid conditions stretched from present-day Arizona all the way across to Nova Scotia and into Africa, so we're talking really big deserts. Here is another climate reconstruction and they helpfully provide a relatively useful map of general climate zones. And another paper on Pangaean climate (focused on the breakdown of the monsoon). In fact, the monsoon was so important to Pangaean climate, there's even a Wikipedia entry about it. Here is a list of papers that reference reconstructions of Pangaean climate.